There are 2 ways CatDV can integration with Adobe Premiere:using the CatDV Adobe Premiere Panel plug in as described below, or using the Send to Command which you can find out more about here. This new CatDV Adobe Premiere Panel Plus (which requires CatDV Server 6.10 or newer) now has additional functionality. 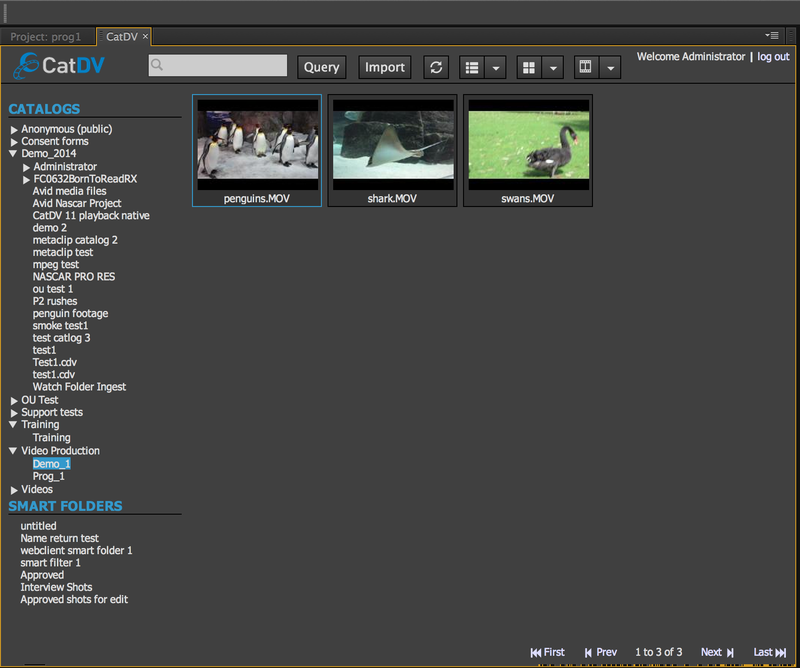 You can browse your CatDV Production Groups and Catalogs from within Adobe Premiere and perform powerful searches and previews of your CatDV database. The CatDV Advanced Panel for Adobe Premiere Pro can be extended to run with Adobe Anywhere for Video™, providing the same, powerful search functions to this leading, centrally managed, production environment. CatDV for Anywhere includes the Advanced Panel for Adobe Premiere Pro, plus additional Adobe Anywhere integration features within the CatDV desktop and web client. As well as original clips, the new CatDV Premiere Panel now supports import of Subclips and Sequences so you can create a rough cut or subclip your material in CatDV and send straight to Adobe Premiere. 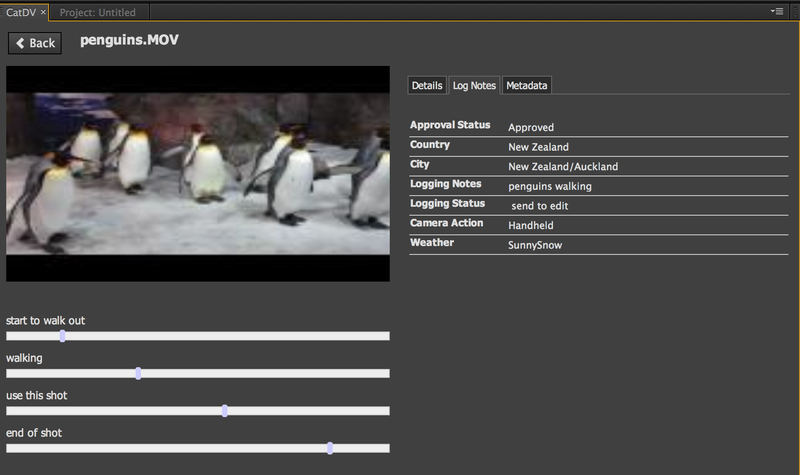 Markers from CatDV on clips and subclips are also supported. All your Smart Folder searches from CatDV are available within the panel allowing for quick and easy access to your stored preset searches. Extensive Server Queries can be performed from within Adobe Premiere by using the CatDV Server Query toolset. You can search across any metadata fields and build up complex search criteria to find the shots you are looking for. Adobe Premiere Panels are available for each CatDV desktop license you have purchased. Additional Adobe Premiere licenses can be purchased. 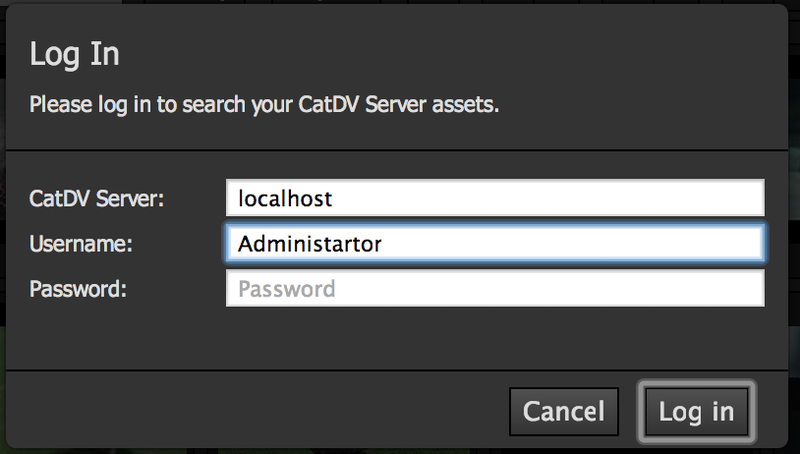 CatDV Production Groups are listed on the left hand side – Just like in CatDV, open each one up to access the CatDV Catalogs. Double clicking on any clip takes you to the clip review panel. Here you can view any markers that are associated with the clip, review your user field lognotes from the CatDV database and metadata fields of the clip. Once you have identified the assets that you want you can import it into Premiere you can import them by clicking the Import button. 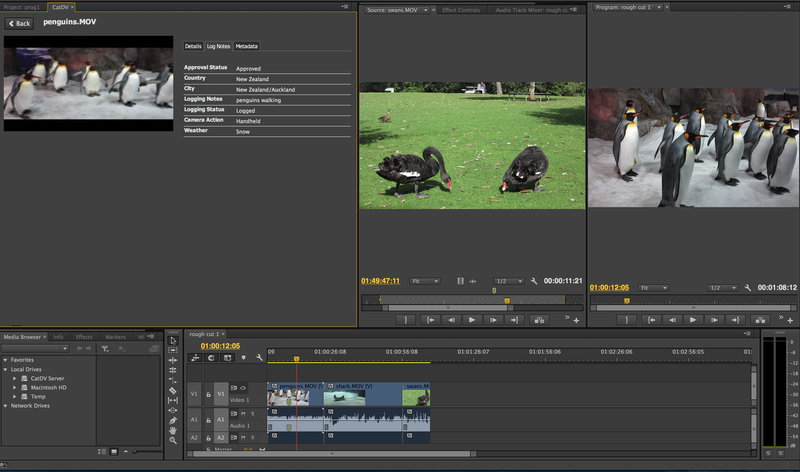 The clip, subclip or sequence will then be imported into Premiere and available for playback. Any markers, in points and out points selected within CatDV automatically import as well for clips and subclips.